Keep America Beautiful Month in April is inspired by a non-profit organization dedicated towards improving our public spaces through action and education. With over 40,000 national events, there’s plenty of opportunity to roll up your sleeves wherever you live. End littering, start recycling, and show visitors how stunning your city can be. From Boston to Seattle, we celebrate this month by beautifying communities in this great land of ours. Get funding to revitalize public parks or cleanup initiatives. Work to ensure your locale has plenty of trash cans in pedestrian-heavy spaces, as this will greatly reduce littering issues. Grants also help to improve areas impacted by environmental or natural disasters that need the goodwill and attention from people like you. Keep America Beautiful has over 650 groups nationwide. You can be become a partner who works with civic agencies and local volunteers to empower and beautify communities across the country. The impact made in one town may inspire the one next door! Downloadable infographics and guides are available for education. Make these messages a part of your work or school place to keep others informed. Discuss the benefits of using restrictive lids or to keep recycling bins next to trash cans so people understand the importance of doing so. Litter has far-reaching consequences. Doing our part to keep trash off the streets means we also protect oceans and waterways. 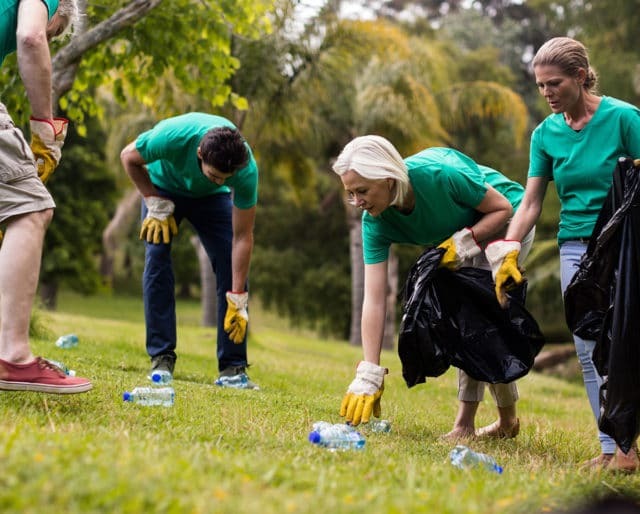 Educating the community on the sources of litter helps offer local ordinances insight into effective solutions. Kids are the future. Service projects let middle and high schoolers take an active role in improving the world around them. By investing time in enhancing their community, they feel integrated in a positive way. Transforming graffiti into art murals or planting urban gardens brings people together in positive ways. When everyone has the chance to lend a helping hand, there’s a shared sense of responsibility in a town or city.